I’m an armchair thru hiker. I’ve read dozens of books and blogs, trolled countless forums and watched umpteen documentaries and YouTube videos about people who thru hike the AT, PCT, CDT, CT, JMT and the PNT. You may recall last year we got to take a small walk on the AT where we met several thru hikers and this only further piqued my interest in thru hiking. If you don’t already know, thru hiking is defined as hiking a long-distance trail end-to-end within one hiking season according to Wikipedia. And all those acronyms above are some of the major long-distance trails in the US, namely the Appalachian Trail, Pacific Crest Trail, Continental Divide Trail, Colorado Trail, John Muir Trail and the Pacific Northwest Trail respectively. I am in awe of the folks who take on these epic adventures on foot completely self supported. And while I think there is a tiny spec of a chance that I could physically take on one of these trails myself, I just can’t imagine being away from Steph for that long…so I remain an arm chair thru hiker. But then one day last fall my brother calls me with a proposal! Joe: “But then I realized that right here in our own backyard is the Colorado Trail…why not hike a section of that? And so began our 2017 section hike of the Colorado Trail adventure. Section hiking is simply hiking sections of major long-distance trails. Some folks will string many of these together over the course of several hiking seasons to eventually cover the entire end-to-end trail. Perhaps I could take this route to hiking one or more of these major trails. But for now, we needed to focus on our upcoming trip and the first order of business was to decide which section or sections we should hike. We researched the trail and set our sights really high by initially picking section 24 and either of it’s adjacent sections in the remote and spectacular Weminuche Wilderness. But as we began to consider logistics of these sections and our inexperience in section hiking we ended up choosing sections 9 and 10 that were closer to home, less remote and were more familiar to us. With the sections selected we now had to put together an itinerary. My brother found a Leadville local who would shuttle us from the end of section 10 where we would leave the car to our start point at the beginning of section 9. It was pricey at $35/person and if we did it again we’d drop off all but one person at our start point, that one person drives to the end point and then we only have to pay one person worth of shuttle service. Pre and post hike transportation finalized we now needed to figure out how to break up the 27 miles over several days. Four miles was the most that I’d ever had the boys do with full packs at elevation when we did Heart Lake last year. So we planned out 5 days of hiking, four of which would be 4-5 miles and one long 9 mile day. I laid this out with the help of a CT guide book I’d borrowed from the library that detailed good camp sites and also this really cool tool called CalTopo. With this free online tool I was able to label a topo map with our camp sites and then create a multipage PDF file with detailed maps for each day which I printed in full color at my local Kinkos. You can check out our custom map below and if you want to dig in deeper, click the little “Open in CalTopo” link in the upper right of the map. I was blown away by this tool!! Next up…gear. Dacen inherited Caden’s old pack and so Caden got a new one along with a much needed wind/rain jacket. My brother and I upgraded our sleeping pads from our 25 year old Thermarests (which the boys got to use) to inflatable pads that are favorites of thru hikers and ultralight backpackers. I upgraded my wind/rain jacket from my 25 year old one that was shredding to a new ultralight and packable one and also picked up a down puffy jacket. I downsized and updated my first aid kit and repair kit. I’d be taking our fancy new Sony a6300 camera so I invested in a couple spare batteries and a Anker 20100 portable charger for 20AH of juice on the go. For cooking we used my existing MSR Whisperlite, 2L cookpot and then each of us got a custom made mess kit which consisted of a Ziploc Twist-n-loc as our bowl, a plastic spoon and a disposable coffee cup with lid left over from church! I also made reflectix jackets for the bowls for insulation to keep the heat in the bowl and off our hands. We also bought a bear canister to store our food. I’ve never taken any precautions against bears in the Colorado backcountry other than keeping my food sealed in Ziplocs and storing food away from our tent like a Country Buffet for bears. Since I’ve always just been out for 1 or 2 nights a loss of food isn’t anything more than a minor annoyance. But we had 5 days and 4 nights worth of food we needed to protect so we invested in the BV500 bear vault. Our final gear upgrade was ditching the heavy Nalgene bottles in favor of Smart Water bottles (the kind you get at the grocery store) and Sawyer Mini’s screwed on the top for each person. The system is simple: scoop up dirty water into bottle, screw filter onto bottle, squeeze bottle to drink, then place entire assembly in your pack’s side pocket. We knew what sections we were going to do and we had some new gear but we still had a big task ahead of us. Nourishment on the trail! 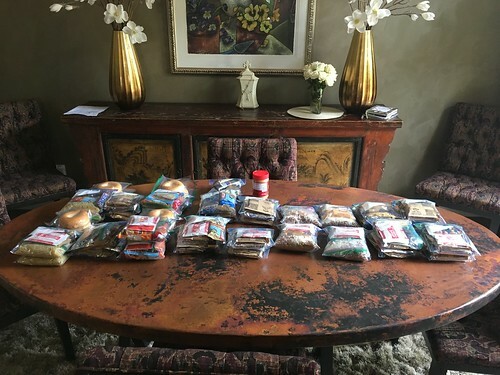 Four breakfasts, 5 lunches, 4 dinners and 5 days worth of trail snacks. We went simple on breakfasts: oatmeal, pop tarts and coffee/cocoa. Lunch was peanut butter, cheese or tuna salad on bagels, fig newtons or crackers (I’ll let you figure out which combinations work and which don’t). Snacks were trail mix, beef jerky and Cliff bars. Then for our dinners we got a little fancy and had Sausage Mac ‘n Cheese, Pizza Ramen, Beans and Rice with Fritos and Cheese, and Jerky Mashed Taters. All of these just required adding hot water and waiting a little bit as they rehydrated/cooked. For dessert we had coffee/cocoa and either Snickers or Nilla Wafers…but one night we had liquid butterscotch pudding. This is a dessert that Caden and I figured out on our Heart Lake trip. We both dislike instant pudding so thought we’d try the cook type using full fat dry milk. But, it never thickened up. However, it makes a very wonderful hot drink and so was born the Liquid Butterscotch Pudding Dessert Drink or LBPDD for short. Just having a menu in place was just the beginning of the nourishment task. The major part of this task was acquiring all the items and packaging them into daily rations for each person. My brother took this on and nailed it. In one day he got it all done and sent me a picture of his table covered in super organized and labeled Ziplocks for each person for each day!!! The day before we left the four of us got together and finalized our packs. My brother carried most of the food but distributed some to each of us including our first day rations. I carried some smaller community gear: stove, fuel, cook set, first aid, repair kit, games, maps, one tent and poop kit while the boys carried another tent between the two of them. The boys’ packs with food and water were just about 25% of their body weight and I think Joe’s and my packs were just under that percentage. This was very disappointing to me because I really wanted to have my pack about 10lbs lighter…oh, and I’d like my body to be 10lbs lighter too but maybe schlepping 20 extra pounds 27 miles at elevation will help with that. We were locked and loaded and we’d be leaving Longmont in the morning at oh-dark-thirty (5:00am)….waaaaaayyyy before anyone in my house is ever up. Here we go!!! Oh man – I bet that was a fun trip. Wished I knew you guys were doing it. Good post!